"The European Union's top court," reports the BBC, "has ruled that non-EU nationals married to EU citizens are entitled to live in their spouse's country." It goes on to tell us that the court has overruled a law in the Republic of Ireland, which grants residency only to those who have previously lived in an EU member state. This is our old friend Directive 2004/38/EC again, on which the court relies for its judgement. 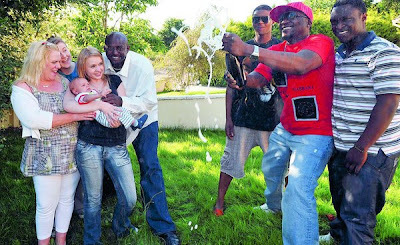 Interestingly, though, neither the BBC, nor a similar report in the Irish Times, gives us any detail or background to the case, the BBC confining itself to the anodyne information that the case against the Irish justice ministry "was brought by four African men married to EU citizens resident in Ireland (pictured above). The men had been refused residence permits." This is the so-called Metock case (Mr Metock pictured below left) - the essence of which is that failed asylum seekers have now established "rights" under EU law to reside in EU member state countries, having married citizens of EU member states while awaiting deportation. But, if this is not bad enough, there is much more to it than meets the eye. For more detail, though, you have to go to the original press release from the ECJ and then, via that to another case report, the so-called Akrich case, upon which this judgement also relies. No one seems to be writing about this background - although The Sun had a few comments at the time - so we've summarised the judgement on this Akrich case. Before you read it, you need to be sitting down on something very solid, with nothing breakable in reach. And so we begin… hold tight. This case, then - which dates back to 2003 - involved a Moroccan citizen by the name of Hacene Akrich. Since 1989, he had attempted on a number of occasions to enter and reside in the United Kingdom. Having no such rights, his applications for leave to remain had always been refused. But, in 1992, less than a month after he had been deported for the second time, Akrich returned illegally to the UK and, in 1996 – having remained here illegally for the best part of four years - he married a British citizen. Thus married, he again applied for leave to remain, claiming rights as the spouse of a British citizen. Unsurprisingly, the British immigration authorities refused him leave and, in August 1997, he was deported to Dublin, where his wife "happened" to be working. There he remained for a time but, in August 1998, his wife took up work in the UK. Akrich then applied again to enter the UK, relying on previous EU case law relating to a certain Surinder Singh (of which he seems to have been advised). This stated that nationals of one member state who had worked in another could, when they returned, be accompanied by their spouses, of whatever nationality, provided they had been in that other country lawfully. Both Mr and Mrs Akrich were questioned by the UK Embassy in Dublin, whence it emerged that they had always intended to return to the UK, "because [they] had heard about EU rights, staying six months and then going back to the UK". In other words, the period in Ireland had simply been a ploy to enable Mr Akrich to acquire residency rights in the UK. Akrich was thus refused entry on the basis that the move to Ireland "was no more than a temporary absence deliberately designed to manufacture a right of residence for Mr Akrich and to evade the provisions of the United Kingdom legislation." Mr Akrich appealed against this refusal to the Immigration Appeal Tribunal, which referred the case to the ECJ. There, the court decided that, on the basis of the Surinder Singh judgement, the UK had been right to refuse Akridge entry. For him to enjoy rights in accordance with that judgement, he would have had to have been lawfully resident in the UK before he had moved to Ireland. However, as to the "abuse" engineered by the couple, this the court declared was irrelevant, even though Akrich had entered the UK illegally, and then it delivered its bombshell. Notwithstanding the fact that he had been an illegal immigrant when he had married, the UK had to take account of the right to respect for family life under Article 8 of the Convention on Human Rights, now enshrined in Directive 2004/38/EC. Thus, the court held that "a non-Community spouse of a Union citizen who accompanies or joins that citizen can benefit from the directive, irrespective of when and where their marriage took place and of how that spouse entered the host member state." Akrich was then able enter the UK with his wife and take up gainful employment, setting the important precedent that illegal entry or residence was no bar to claiming EU rights of establishment. It is that which this current judgement "developed", so extending its application. As it now applies to Metock and his co-plaintiffs, because they have married citizens of EU member states, they can remain in the country to which they first came, even though they were unlawfully resident in that member state when they married. By this means, they acquire their rights of residence. So, what we have is the ECJ confirming, through a series of incremental judgements, that there is an open door for illegal immigrants, over which member states have no control. As long as third country nationals can get here or to any other member state by any means (whether illegal entry or by falsely claiming asylum) and evade the authorities long enough to marry EU citizens (who themselves may have been recent immigrants, as was Metock's spouse), EU law gives them an absolute right permanently to stay here or anywhere else in the EU. And, of course, once they have been resident for five years, they too become "EU citizens" which means that, under Directive 2004/38/EC, they are entitled to bring over their mothers and fathers, any children they might have, and even grandparents and cousins, if they are dependants. No wonder the Beeb and others didn't want to give us any details of this case. They, the EU and the ECJ are taking us for mugs, and they really would not want us to know that. Hibernia girl has some useful background links, particularly here. This is not going to play well in Ireland, as some 1500 cases there are to be reviewed. 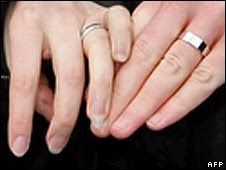 It is interesting to note that, to illustrate its piece, the BBC shows the hands of a white couple (above), as does the RTE news report embedded by Hibernia girl. Yet, all the appellants were black Africans. Also of interest is that, although this is an EU judgement and applies thus to the UK (and any other member state), the British print media has not reported the story. Following the Hacene Akrich judgement, Lord Tebbit tabled a parliamentary question asking, whether, following the ruling, "the United Kingdom remains sovereign in respect of its immigration policy." Following the European Court ruling in the case of Hacene Akrich, the United Kingdom remains sovereign in respect of its immigration policy. Following the European Court of Justice case of Surinder Singh, which was delivered in 1992, the non-EEA family member of a British national, who has legally resided in another member state, may claim a right to enter and remain in the UK under EC law instead of the UK's Immigration Rules. In the European Court of Justice case of Akrich, the court was asked to determine whether a member state could refuse to apply the Surinder Singh judgment to a British citizen who had deliberately moved to another member state with the express intention of creating an initial right of residence in the UK for their third country national spouse. The court found that third country national spouses of EU nationals can only benefit from EC law if they have legally resided in another EU state before they first came to the UK. This court ruling supports the UK's view that third country nationals who are illegally in the UK, and marry British citizens, should not be able to use EC law to remain here. It will allow the UK to continue to be able to apply its national immigration legislation in such cases. The answer is, to say the very least, disingenuous. To say that the court found that third country national spouses of EU nationals can only benefit from EC law "if they have legally resided in another EU state before they first came to the UK" is hardly true. Akrich may have legally resided in Ireland, but he had been deported there having entered the UK illegally. What the court had actually found was that, even though he had first entered the UK illegally, his "rights" under the Article 8 of the Convention on Human Rights took precedence over UK law and his illegal entry could not be taken into account.